It’s time again for Final Friday on Friday August 26. 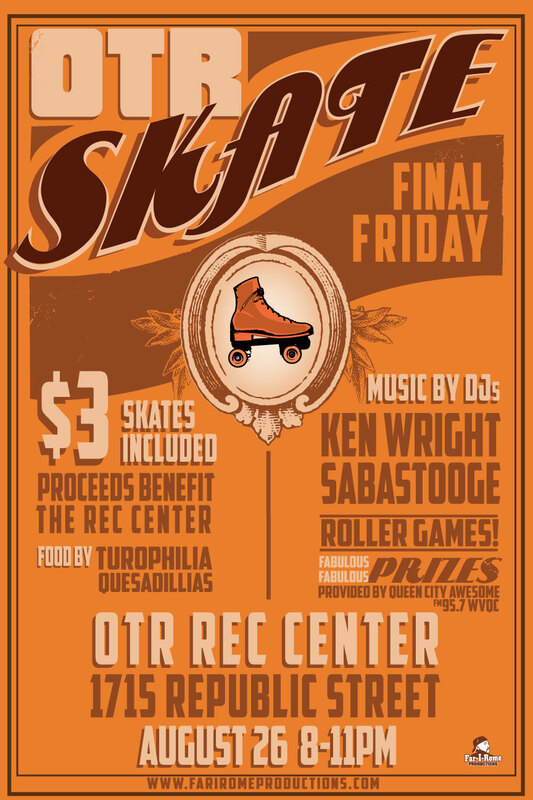 That means its time again also for the Final Friday OTR Skate at the Over-the-Rhine Rec Center. Below is the press release from Far-I-Rome Productions, who is presenting the event. It’s definitely a good time, and every should try to make it out! 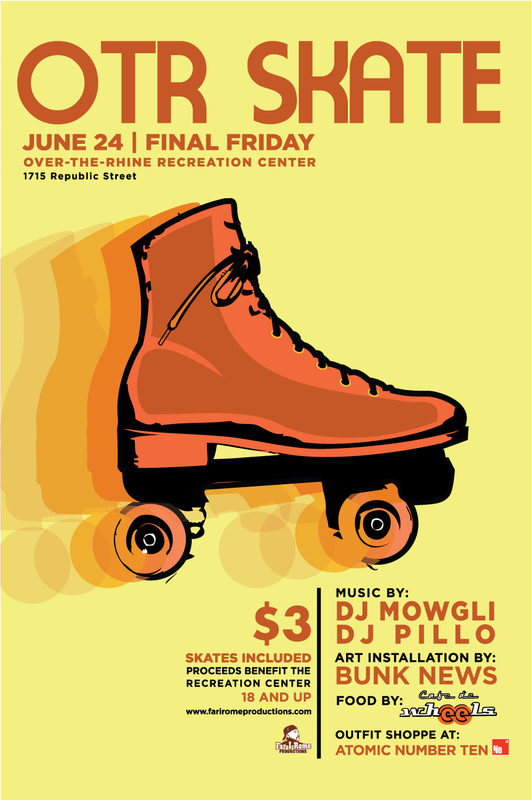 CINCINNATI, OH – Far-I-Rome Productions is proud to present the third installment of the Final Friday OTR Skate, Cincinnati’s only Final Friday roller disco. The event returns August 26 at the Over-the-Rhine Recreation Center. This time around, OTR Skate will feature DJs Ken Wright (The Project Mill) and Sabastooge and quesadillas by Turophillia Quesadillas. Skaters can expect to hear a mixture of mashups and indie dance pop by DJ Ken Wright and old school rollerskating songs by DJ Sabastooge. While the OTR Skate’s tried-and-true formula of innovative DJs and food trucks never fails to bring people in, the OTR Skate is pushing the nostalgia with roller games like limbo, races and “DJ Says.” Prizes include passes to Clifton Heights Music Festival in October and a prize pack courtesy of WVQC’s (95.7 FM) Queen City Awesome. Those who prefer to keep their feet on the ground can still enjoy free Wii, foosball, pool, ping pong and bumper pool courtesy of the OTR Rec Center. Cover for the OTR Skate is $3, which includes skate rentals. Proceeds benefit the Over-the-Rhine Recreation Center. Though the admission covers skate rental, people who own their own skates or rollerblades are encouraged to “bring ‘em if they got ‘em”, since the Rec Center has 120 skates, first come first serve. The OTR Skate is an 18 and up event.